The ChemBio team is involved in the design and the synthesis of chemical tools in view of their application in life sciences. The team researches focus on the increase of chemical diversity via the synthesis of new aromatic heterocycles and transition organometallic complexes (Fe, Ru, Rh, Os…). These new chemical tools are designed towards applications in (1) medicinal chemistry ; (2) bioanalysis and cellular imaging and (3) aqueous phase catalysis (artificial enzymes). 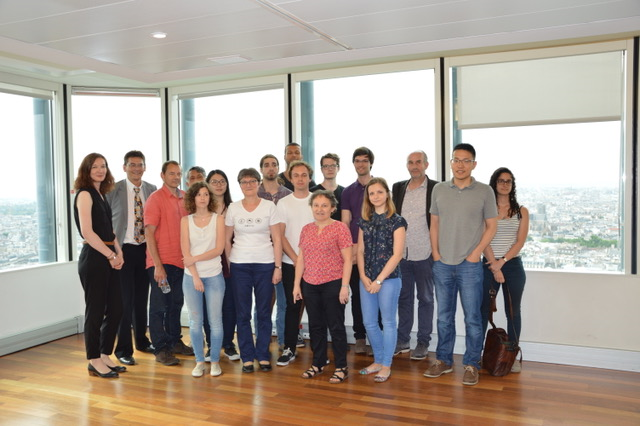 This team offers complementary skills in organic and organometallic synthesis, spectroscopy (infrared, fluorescence), enzymatic catalysis, immunochemistry and cell culture. Bioorganometallic chemistry, heterocyclic chemistry, total synthesis, medicinal chemistry, bioconjugation, artificial enzymes, ferrocene, antibodies, metal carbonyls, dendrimers, fluorophores.